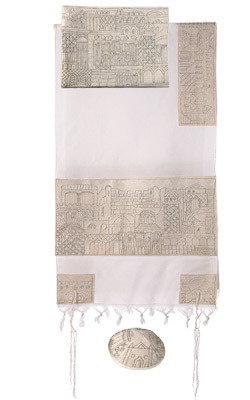 Jerusalem in Silver Tallit – Completely Hand-Embroidered CAT# TNE- 4. Size: 18” X 75” . made of hand – woven cotton. The motifs are hand – embroidered on a separate piece of raw cotton fabric using various colors of silk, gold and silver threads. 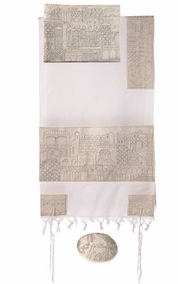 The word tallit in Modern Hebrew is pronounced ta-LEET, with the stress on the final syllable. Less common today, but historically widespread, is the pronunciation talletThe same word is pronounced TA-les in Yiddish, with the stress on the initial syllable.The plural of tallit in Modern Hebrew is tallitot, pronounced tah-lee-TOT; the traditional Sephardi plural of tall?t is talletot, pronounced tah-leh-TOT. The Yiddish plural, which has its roots in the Mediaeval Ashkenazi masculine form tall?t (compare Modern Ashkenazi/Israeli Hebrew tallit gadol with the masculine form of the adjective) with the analogous plural ending -im and diphthongisation of the accented ?, is taleisim, pronounced tah-LEY-sm.